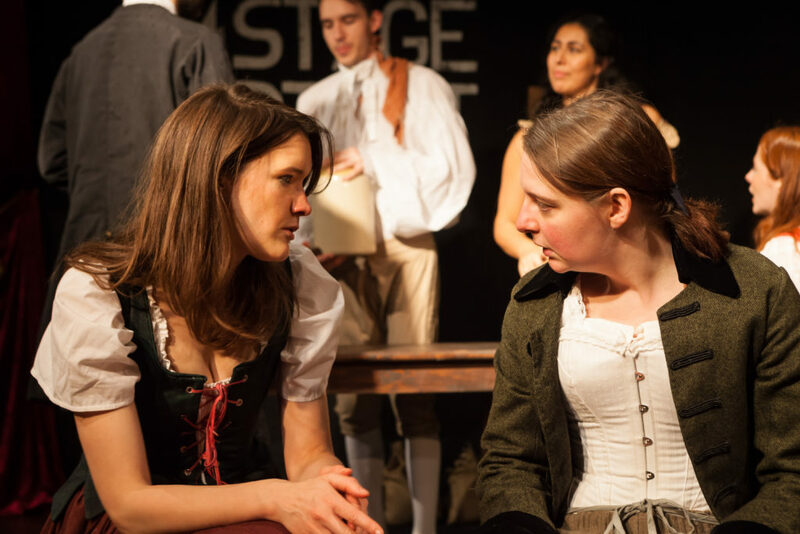 Mercurius Theatre’s Indebted to Chance explores the true story of Charlotte Charke, an 18th century actress, writer, and businesswoman who defied societal expectations of femininity and obedience. Known for “britches roles” (women playing male characters), Charke also frequently dressed in men’s clothing off-stage, and occasionally passed as a man. Author Charlie Ryall has mined Charke’s autobiography and come up with a funny, fresh, irresistibly interesting story about a woman who persists in doing what she wants, and being who she is, in spite of the considerable forces aligned against her. Indebted to Chance interrogates the volatile relationships Charke (played by Ryall) has with her father (Andy Secombe) and her husband (Benjamin Garrison), and sheds light on her perhaps not-so-platonic feelings for the enigmatic Miss Brown (Beth Eyre) of her memoirs. This is smart, fun, irreverent theatre. It is consistently funny and entertainingly self-aware. Ryall is canny in knowing when not to shy away from silliness (there’s nods to Monty Python and a memorable fish-slap). In an age where dark drama reigns, it’s a delight to find a performance that’s intelligent, relevant, opinionated, and doesn’t take itself too seriously. As the play mainly takes place in the theatre managed by Charke’s father, Ryall and director Jenny Eastop playfully approach the play-within-a-play scenario. The actors interact with the audience, cleverly acknowledging that we are both their 18th century audience, and their modern audience. The performances are strong throughout. Ryall wins the audience over easily as the stubborn, acerbic, exasperated Charlotte Charke. There’s a genuineness to her that pulls you in. Garrison is convincing as the charming, emotionally abusive husband, and Lydia Bakelmun (playing Betty Careless), has wonderful comedic presence. Eastop and designer Sunny D. Smith are highly efficient with the small space, minimal props, and a sparse set. Dangling ropes are creatively used to create a jail cell. The costuming is effective, and does the heavy lifting in transporting the play to the 1700s. Some issues overall involve abrupt transitions that can be disorienting as the story jumps backward and forward in time, and weak central narrative. Indebted to Chance is more like a patchwork of scenes than a progressing story. It’s a testament to the strength of the characters and dialogue that the play never feels like it’s dragging. Those wary of plays set pre-1900, due to the density of the language, needn’t be put off. The dialogue is calibrated for a modern audience, and is anything but dry. It’s skilfully written, clever, and very funny. The intermission break is a surprise – the first hour sails by. This is a two-hour performance that earns its runtime. Indebted to Chance is an ingenious play about an extraordinary woman who refused to play by her society’s unfair rules. It’s sharp, it’s current, and it has an excellent sense of humour.